Check out the latest Xbox enabled title released by Ubisoft, Hungry Shark Evolution! The game boast console quality 3D graphics as well as gameplay that will have you coming back time and time again! 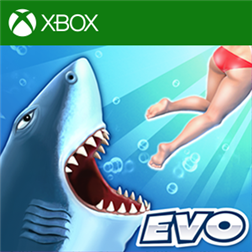 As a bonus Hungry Shark Evolution has also been released on both Windows and Windows Phone 8 as an universal app!.. Don’t know about you but cheevo’s are my life!! Feast on tasty sea creatures, swimmers, turtles and fishermen to grow into a giant. Battle enemy sharks, submarines, and the weird creatures of the deep. Chain up combo bonuses to gain massive his scores! Regular updates on the way – new features, content and challenges to keep you coming back for more!